Gretchen, GHBooks, sent this beautiful book for our third book swap. 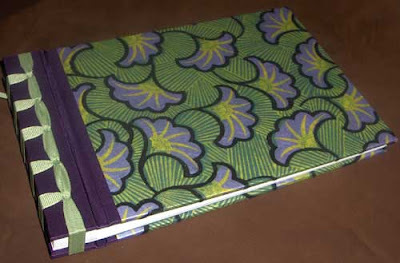 It is a stab bound book, covered with a decorative flocked Indian paper featuring purple and green ginkno fans and pretty purple bookcloth on the spine. The pages are heavy Stonehenge paper with spacers between each page so it can be used as an album. There is dark green lokta for endpapers, and some soft unryu paper for the first and last pages. 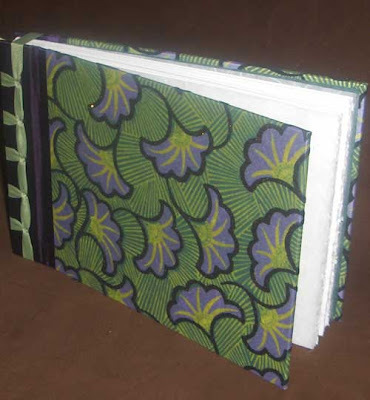 Binding is done using green grosgrain ribbon. Visit GHBooks.Etsy.com to see more of Gretchen's work. That's terrific. I hope you enjoy it. I absolutely love the flocked paper. I am so drawn to both the texture and pattern of the paper (and the colors as well!). All of the books look lovely! I can't wait to receive one in the mail. Gretchen - what a beautiful book, and with stonehenge pages, it sounds just lovely!